Photo by Dan Sudia/USFWS The Worm-eating Warbler’s subtle plumage sets it apart from more colorful members of the warbler family. When I am asked why the warblers are one of my favorite families of birds, I often tell the questioner I enjoy warblers for the splash of bright colors many of them bring to our local woodlands. Strictly speaking, however, that’s not true for every warbler. In fact, some of them are little brown birds lacking any brights colors such as orange, red, yellow or green. One of my favorite brown warblers is the Worm-eating Warbler. I suppose I have a sentimental attachment because it is one of the first warblers I ever saw. 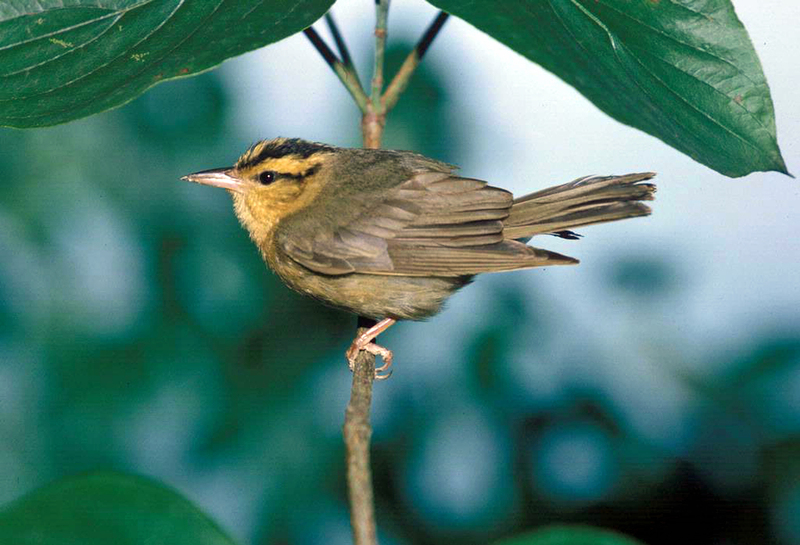 Sadly, Worm-eating Warblers have disappeared or declined in some areas due to habitat loss. They are also vulnerable to nest parasitism by Brown-headed Cowbirda. A few of these warblers routinely made their home each summer in the woodlands around my home for many years. Unfortunately, they do not seem as common as they were a decade ago. I’m not sure if the habitat has changed or if this subtly understated warbler has simply become less common. 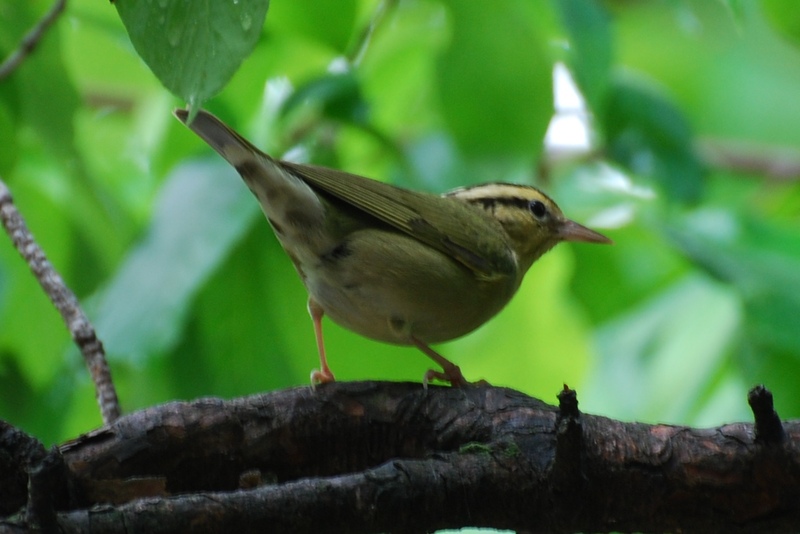 The Worm-eating Warbler favors steep slopes with dense understory. Photo by Jean Potter The Worm-eating Warbler nests during the summer months throughout the eastern United States. The Worm-eating Warbler’s breeding range stretches from southeastern Iowa, Ohio, New York and southern New England south to northeastern Texas, central Gulf Coast states and eastern North Carolina. This warbler, like most of its kin, winters in the tropics, migrating each autumn as far as southern Mexico and Central America. This warbler’s appearance is not at all flashy, especially compared to warblers with much brighter plumage such as the American Redstart, Blackburnian Warbler and Chestnut-sided Warbler. The Worm-eating Warbler’s head and underparts are buffy, and the bird has a unique head pattern consisting of black crown stripes and a dark stripe through the eye. The Swainson’s Warbler is similar, but larger and warm brown rather than buffy in coloration. At a glance, the Worm-eating Warbler might also be mistaken for a wren or small sparrow. Known by the scientific name of Helmitheros vermivora, the Worm-eating Warbler is the sole member of the genus Helmitheros. At first, this bird would be seem to be one of the misnamed warblers. On closer examination, however, its name is quite appropriate. While it does not feed on earthworms, this warbler is quite fond of caterpillars, which are often referred to — mistakenly — as worms. They also feed on insects and spiders. 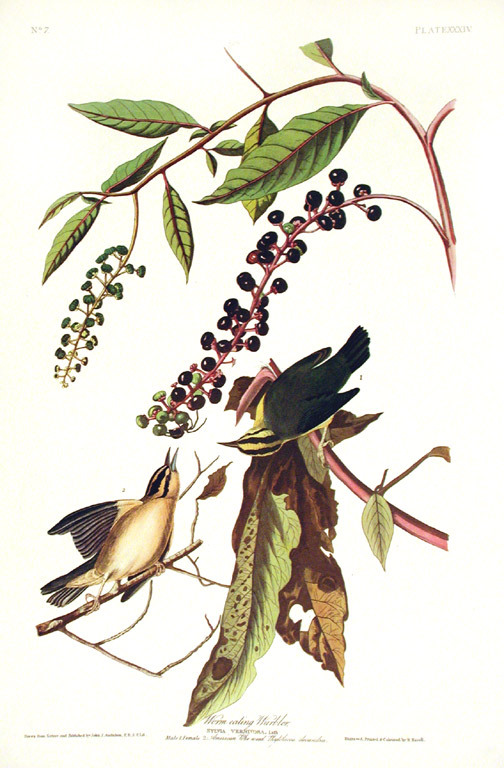 This painting of Worm-eating Warblers by John James Audubon shows the birds probing in dry leaves for small caterpillars. The Worm-eating Warbler does have a distinctive feeding behavior that I have observed on numerous occasions. These birds like to hang upside-down beneath a cluster of dry or dead leaves. They use a relatively long bill to probe for insects or caterpillars concealed within the mass of leaves. More often than not, their search is rewarded with some sort of prey item. The male and female Worm-eating Warbler are identical. The female builds a nest on the ground, which she attempts to hide among dead leaves. She lays four or five eggs, which she incubates herself. Once the young hatch, her mate does help feed them. The parents also guard the nest and are known to try to distract potential predators by feigning injury. In the spring, when the males are singing persistently, these birds can easily be located by their song. The male sings a short, high-pitched trill that is similar to the song of the Chipping Sparrow. Photo by Jean Potter The Ovenbird is another of the brown warblers that nest in North America. 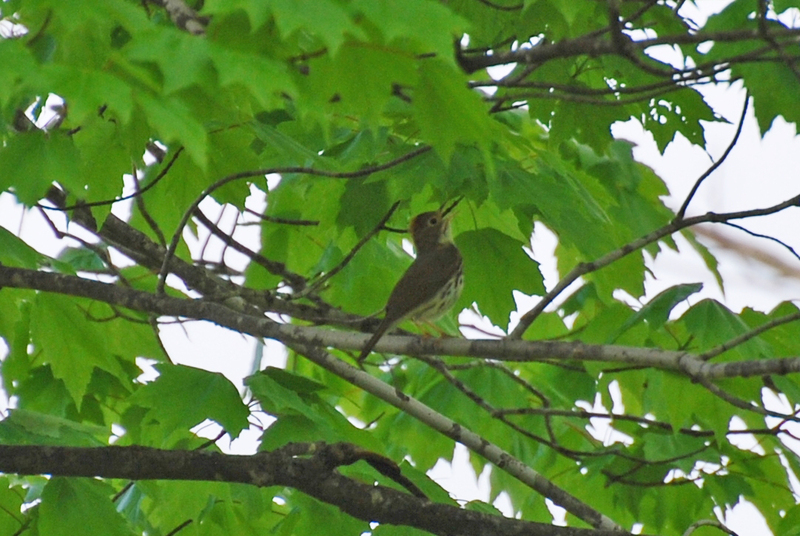 Other brown warblers include Ovenbird, Swainson’s Warbler, Northern Waterthrush and Louisiana Waterthrush. Like these four species, the Worm-eating Warbler is a summer nesting bird in Northeast Tennessee. This fall has been a good time to see warblers. Some of the more common ones I have noticed in the yard so far have included Tennessee Warbler and Black-throated Green Warbler. Here’s some trivia for you should you ever find yourself competing on the game show “Jeopardy” and the category is “Warblers.” Four of our warblers — Kentucky Warbler, Louisiana Waterthrush, Connecticut Warbler and Tennessee Warbler — bear common names that honor states. The Kentucky Warbler and Tennessee Warbler are named for the states where they were first found and described by ornithologist Alexander Wilson in 1811. Neither the Tennessee Warbler or Kentucky Warbler are particularly affiliated with the states for which they were named. In fact, the Tennessee Warbler passes through the Volunteer State only for a few weeks each year during spring and fall migration. Its closest breeding range is in Michigan and these warblers spend the winter in Mexico or farther south. Here’s something that might also come in handy in a test of your knowledge of trivia some day. Not only is the Tennessee Warbler named for the state, but the capital city of Nashville also has its name linked another member of the warbler clan, the Nashville Warbler. Photo by Bryan Stevens The Northern Mockingbird has served as the state bird of Tennessee since 1933. Should we ever decide to drop the Northern Mockingbird as state bird, the Tennessee Warbler would already pay tribute to our state with its common name. Of course, there is that inconvenient truth that the warbler is only a brief visitor to the state each year. I don’t foresee any plan to remove the mockingbird from its official designation. 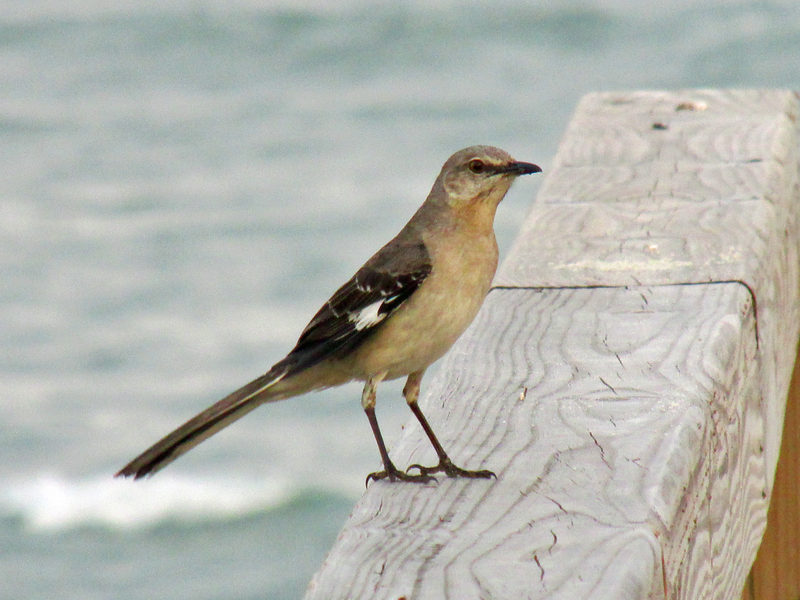 The Northern Mockingbird was selected in 1933 as the official bird for the Tennessee. This relative of the Brown Thrasher and Gray Catbird also serves as the state bird for Arkansas, Florida, Mississippi and Texas. At my home, Northern Mockingbirds are usually evident only during the winter months. I haven’t seen one at home so far this year. This entry was posted in Uncategorized on September 20, 2015 by Bryan Stevens.